Up Next is the course we recommend you study now, and On Deck covers the courses that you should next, in order of urgency. 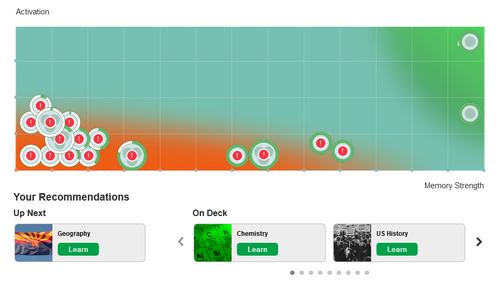 You can scroll left and right through all your On Deck courses, and as you rollover a recommended course, you’ll see its position highlighted in your Memory Bank above. If your Memory Bank is getting a little crowded, you can hide courses from it with a new show/hide toggle we just added to each course on your Learn page. Flipping to hide will hide the course from your Memory Bank. To see it again, just switch back to show.